Sterling Silver Heart Bracelet, Handmade Heart Bracelet, Copper Heart Bracelet, Hammered Silver Bracelet with Heart. Home > Bracelets > Sterling Silver Bracelet with Copper Heart. Heart Bracelet. 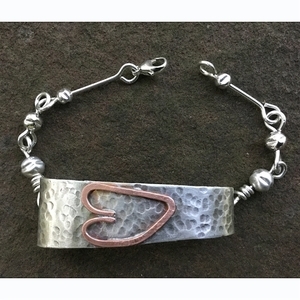 Hand hammered sterling silver with copper heart, sterling silver wire and beads. Approximately 7.5 inches long and can be adjusted.This heart bracelet is one of a kind and made in the USA by The Fun Company Jewelry.